Nikki Bass grew pretty fond of Route 50 over the last decade. The Frogtown resident said the route not only took her where she needed to go but moved at an ideal pace – brisk, but casual enough to let her take in the sights along the way. On Friday, June 13, Bass spent a little more time looking out the window than usual. That’s because she was among several customers aboard Route 50’s final eastbound journey, which departed downtown Minneapolis shortly after 6 p.m. 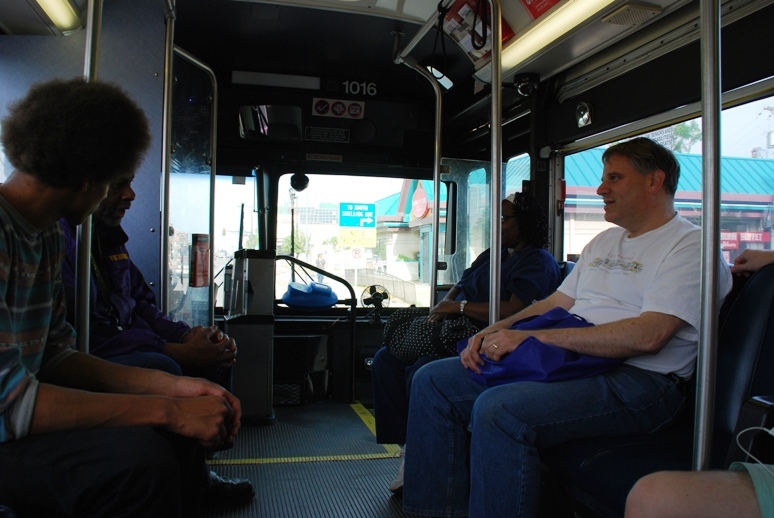 Despite their nostalgia, Bass and other passengers making their final trips on Route 50 last week said they knew losing the bus meant gaining something even better – reliable, efficient all-day service on the METRO Green Line. Trains replaced Route 50 buses because the Green Line covers the same territory and can provide service more efficiently. Route 50’s final run came almost 16 years to the day after the limited-stop bus service was introduced in an effort to attract new riders who wanted a faster, more efficient service on University Avenue. Route planner John Levin spoke with Minnesota Public Radio about the route on its first day of service, June 15, 1998, in an interview that can be heard here. As Green Line trains began running down University Avenue, several bus routes in the Central Corridor were improved to make the most of the new light-rail service. Besides Route 50, routes 8 and 144 had their final runs on June 13 as service was consolidated with other routes to improve efficiency. While many Route 50 customers looked fondly on their years riding the bus, their was also excitement about the Green Line's opening. Among those looking forward to the change was Cameron Kolbe, who has commuted on Route 50 for the last eight years. Sherry Hurt, who lives near the Green Line’s Victoria Street Station, said she turned to Route 50 two years ago so she could avoid the hassles of driving to work. She plans to use the Green Line to get to her job near the U of M campus and to run errands on University Avenue. Being on the final Route 50 trip was particularly symbolic for Melissa Williams, a St. Anthony Park resident who has commuted by bus for nearly a decade. On Saturday, June 14, Williams and her four-year-old son had tickets to be on the first Green Line train departing Raymond Avenue Station. Riding Route 50 for the last time, Williams said she saw the Green Line’s opening as an historic moment for the community. 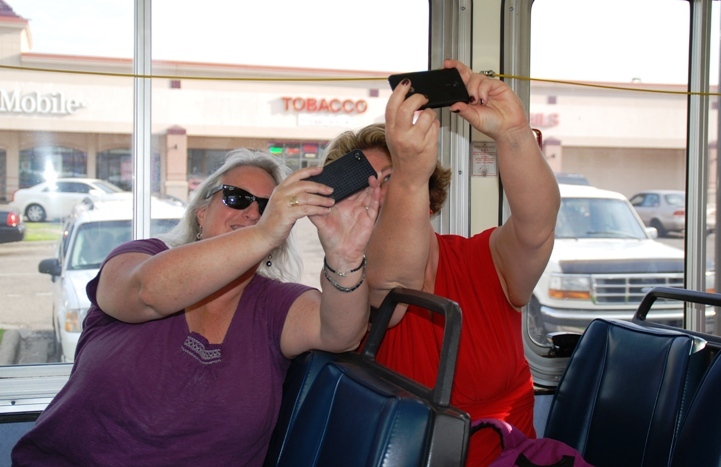 Photos: Top right, Jodi Elowitz and Debra Jane take their photo while riding on the final eastbound Route 50 trip; the two have commuted to and from the University of Minnesota on Route 50 for the last three years. Bottom left, John Levin, who devised the route as a planner for Metro Transit, rides home after work on Route 50's final day of operation.